This would be a great opportunity for a group or organization to adopt our playground for general upkeep! Our playground is used by children of all ages and they would greatly benefit from a safe and clean playing environment. This project would include clearing and raking sticks and leaves from play area and fence line that impedes access to equipment as well as weeding, edging, pressure washing, other objectives that will promote an aesthetically pleasing and safe play area for our children. Our courtyard and pollination gardens are the perfect project for groups who enjoy Mother Nature in all her beauty. The courtyard is a focal point for our families and students who enjoy having their lunch or study outdoors in a safe, peaceful and serene environment. Events and special celebrations are enjoyed with our staff, families, and guests. 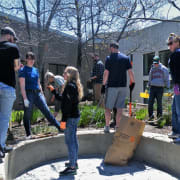 This project would include raking, weeding, watering and feeding plants, pruning, trimming, edging, mulching in appropriate seasons, while sweeping and possible pressure washing paved areas. The Center emphasizes safety at all times while working and enjoying the many offerings here. Group projects are always available and can be discussed in further detail. We can typically tailor a schedule to fit yours. Groups are perfect for these outside projects!